Spondyloarthritis – Never heard of this before? – Pain. Health. Exercise. Spondyloarthritis – Never heard of this before? Ever seen someone in their middle age, whose spine is so stiff that he cannot even turn back to look at the person calling out for him? That person is likely to be suffering from Ankylosing Spondylitis, a sub-group of Spondyloarthritis. If you are interested to learn more about this condition, please sign up for this free public talk on the 24th October 2015. Most people with Ankylosing Spondylitis eventually end up with a ‘?’ posture that is out of their control. They will develop very significant spinal stiffness. Ankylosing Spondylitis is a systemic (whole-body) inflammatory disease that affects many joints in our body. 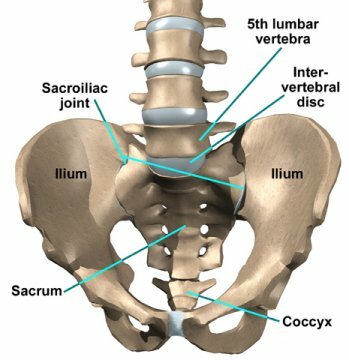 It initiates with inflammation at the sacroiliac joints, which is located right between your tailbone and your buttocks. Many parts of your body can get affected, mainly the whole spine, hip joints, eyes, tendon/ligamentous areas. Most people with this condition has this gene (HLA-B27), and it’s thought that a combination of this gene with unknown environmental factors will cause the disease. A small percentage of people with this gene do not develop this disease. Because the initiate symptoms of Ankylosing Spondylitis is buttock pain and spinal stiffness, it could mimic the common backaches that youngsters have. X-ray findings during early stages is unfortunately normal. Physiotherapists who suspect their clients suffer from early onset Ankylosing Spondylitis can learn how to perform some orthopaedic physical tests to increase the index of suspicion for this condition. Therefore, it is seldom diagnosed early unless one takes a detailed history of signs and symptoms and an early referral to a rheumatologist. Just today, I found out that a current famous Taiwanese singer is suffering from Ankylosing Spondylitis. Can you guess who? Actually I shouldn’t be surprised at all. Thinking back the time when I was working in SGH’s Autoimmune and Rheumatology Centre (ARC), some of the clients that I have worked with previously were quite athletic and able! A national swimmer, expert piano teacher, endurance cyclist who does 100km on one sitting, rugby player. This shows that many with Ankylosing Spondylitis can lead active lifestyles if the right help is provided. Current research shows that the best way to manage Ankylosing Spondylitis is with disease-modifying medication and specific exercise prescription by a physiotherapist. New drugs have been developed in this area and it has shown to be very effective to reduce pain. However, it is very expensive still. Exercise should include stretching, strengthening and aerobic exercises. The stage of the disease usually affects the type of exercises prescribed, hence a specific program needs to be prescribed by a physiotherapist. Exercise is very important because it can reduce pain, improve function and return you the quality of life you desire. There is also an Ankylosing Spondylitis club located in Tan Tock Seng Hospital. They hold weekly sessions of supervised exercise under the supervision of a physiotherapist and it is very affordable to join. Something that I have seen is that stress is often a trigger of ‘flare-ups’ in this group of people. During stressful periods, the inflammatory pain can increase and it is always a downtime for these people. Therefore, effective stress management is essential as this disease is incurable and lifelong. After learning about this condition, you can try downloading the Ankylosing Spondylitis called “iAnkSpond” on your Apple device to learn more about this condition! Previous Post I feel no pain.